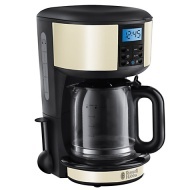 alaTest has collected and analyzed 498 reviews of Russell Hobbs 20682/3 Legacy. The average rating for this product is 4.5/5, compared to an average rating of 4.4/5 for other products in the same category for all reviews. Reviewers really like the performance and maintenance. The design and price are also mentioned favorably, but some have doubts about the durability. There are some mixed opinions about the capacity and reliability. We analyzed user and expert ratings, product age and more factors. Compared to other products in the same category the Russell Hobbs 20682/3 Legacy is awarded an overall alaScore™ of 89/100 = Very good quality. Love this. Saves space, has nice lights on it when brewing. Easy to clean. Thanks Littlewoods. works as it says but the clock light doesn't stay on unless the machine is brewing. First class product. Very easy to use. Makes a very good cup of coffee. Very easy to use great color ! It's my first coffee machine so I'm very happy with it . After a year of indifferent coffee the water is issuing steam into the kitchen so very little water gets into the jug so it is going to the dump today! Works a treat, tasty coffee, good features, clock and set up very easy.